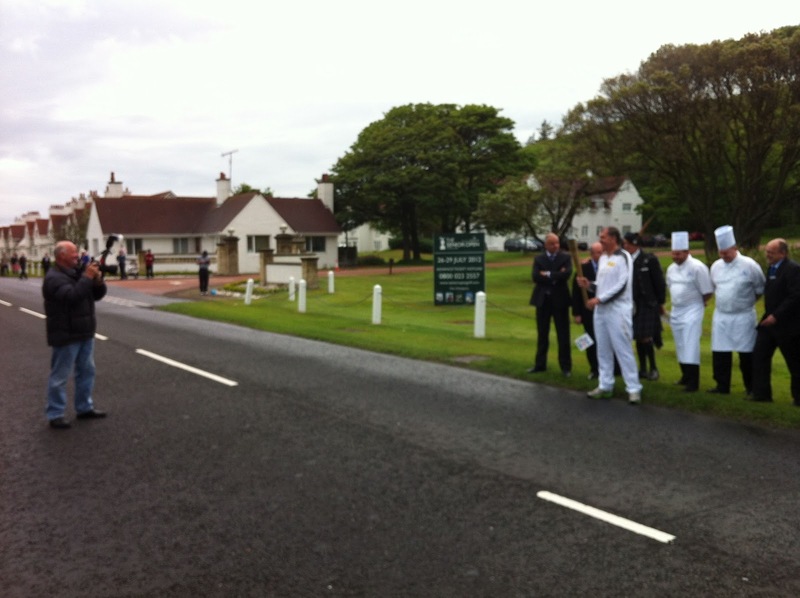 Flanked by police outriders, the lorries trundled slowly towards the line of staff waiting patiently outside the Turnberry Hotel. 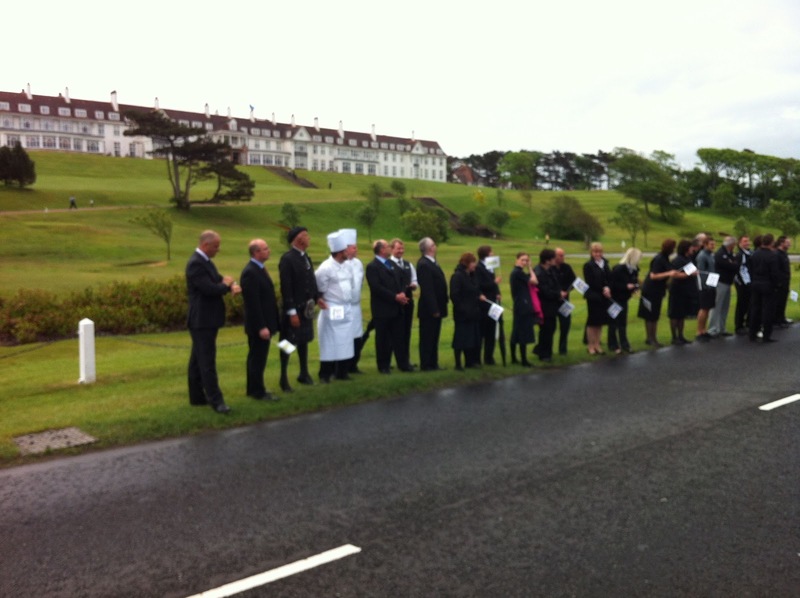 Receptionists, chambermaids, waiters, two chefs and a kilted doorman had been neatly arranged on one side of the road so the photographer from the Ayrshire Post could get a nice shot of the hotel behind them. Everyone had been given a little flag to wave, with “South Ayrshire Council” on the side. This was, according to a Scottish government minister, a chance to “put Scotland on the world stage”. The Olympic torch relay was passing by and the world would be watching. In fact, the only people watching were a group of American golfers waiting to start their round and a few sleepy guests, including Granny and the rest of our family, dragged out of bed for this once-in-a-lifetime experience. The Olympics people had put banners on all the lampposts, and presumably cleared the route of any illegal Olympic logos made by subversive primary schoolchildren. 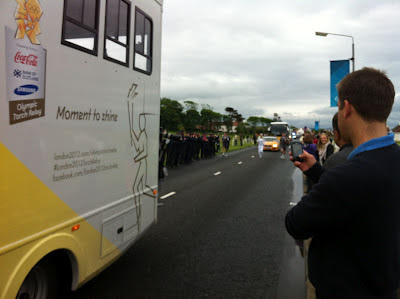 They’d timed it to the second: the torch would arrive at 8.09am, and pause for exactly seven minutes to allow the press (well, the man from the Ayrshire Post) to take photographs. To my surprise, when we turned up a few minutes early, the torch was already there, held by a man in a tracksuit. It was gold and shiny and full of holes, a bit like the Euro. 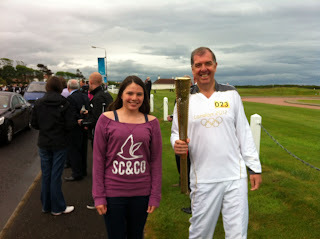 The man let us touch it, though 6-year-old Johnny wasn’t allowed to carry it in case it dropped. To my surprise, the flame was out. 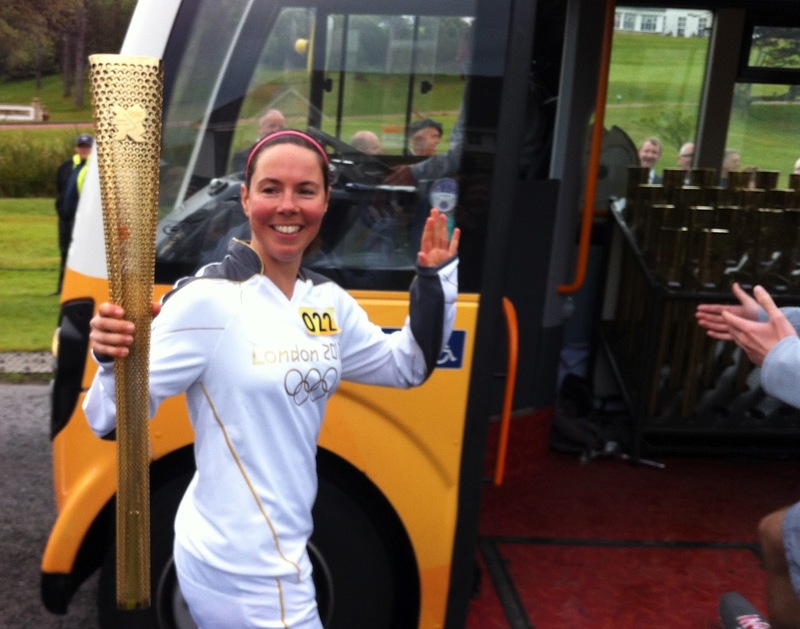 Then it dawned on me, and how silly of me not to realise it before: there wasn’t just one Olympic torch, there were two of them. I felt rather disillusioned. I’d always imagined a unique creation, lit by the pure heat of the Olympian sun, welcomed by Greek actresses in nighties performing ancient choreography, then carried aloft by athletes across Europe and around the highways and byways of the United Kingdom before being cheered by millions into the Olympic Stadium. So, there’s a reserve torch? Fair enough, the weather in Scotland is notoriously unpredictable and gales were forecast that afternoon – better to be safe than sorry. Then loud music and a bright red lorry arrived, packed with smiling youths handing out bottles of elixir from the Gods. Except not even Johnny wanted Coca Cola at 8am. A girl tried in vain to interest the American golfers: “It’s free Coke”, she cried. Frankly, we’d rather have had a warm bowl of porridge. 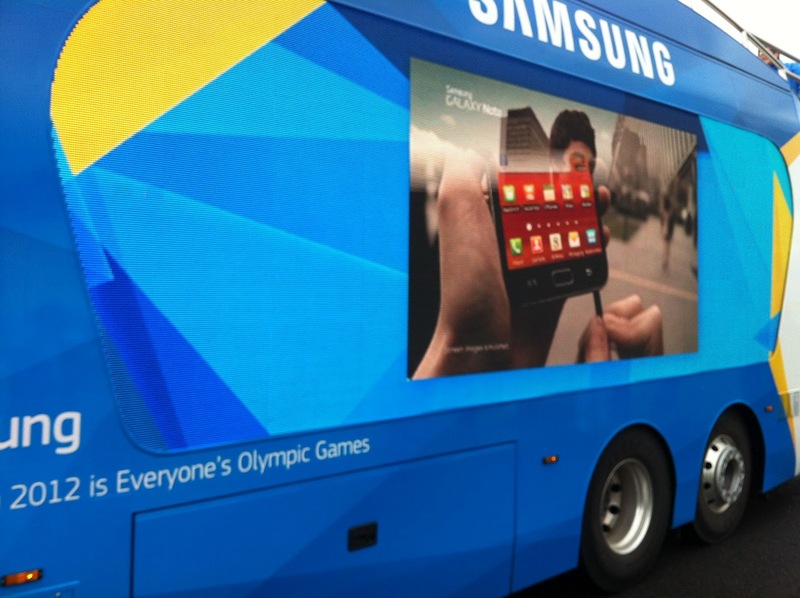 I was excited about the second lorry, though, which was blue, and had Samsung on the front. I’d have gratefully accepted a free phone, but all we were offered was a video advert. 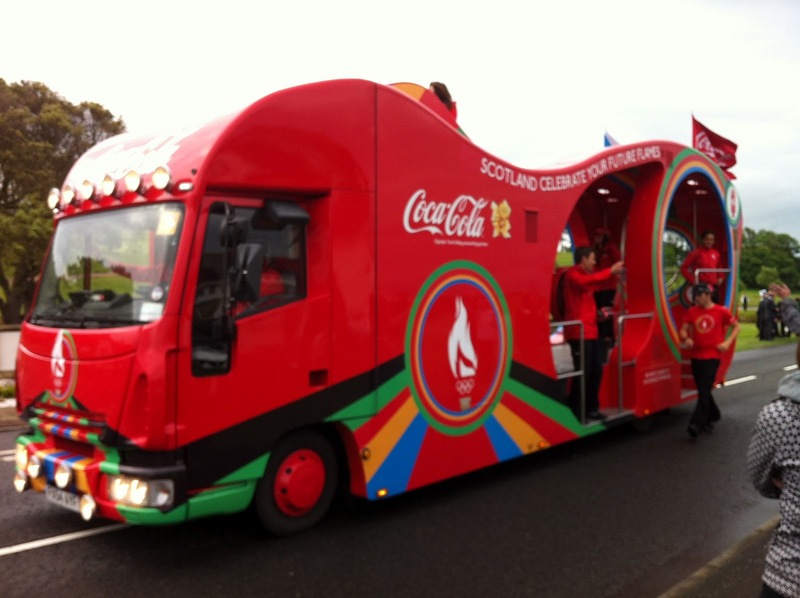 The spectacle over, the two lorries trundled off to the next town, and a loudspeaker announced that “the Olympic Torch will arrive in five minutes”. Exactly on time there were more blue flashing lights and a few gold painted vehicles then, panting furiously, came a local runner called Toni, who’d been chosen for her “inspirational, motivational qualities”. “You can walk now”, shouted an official. 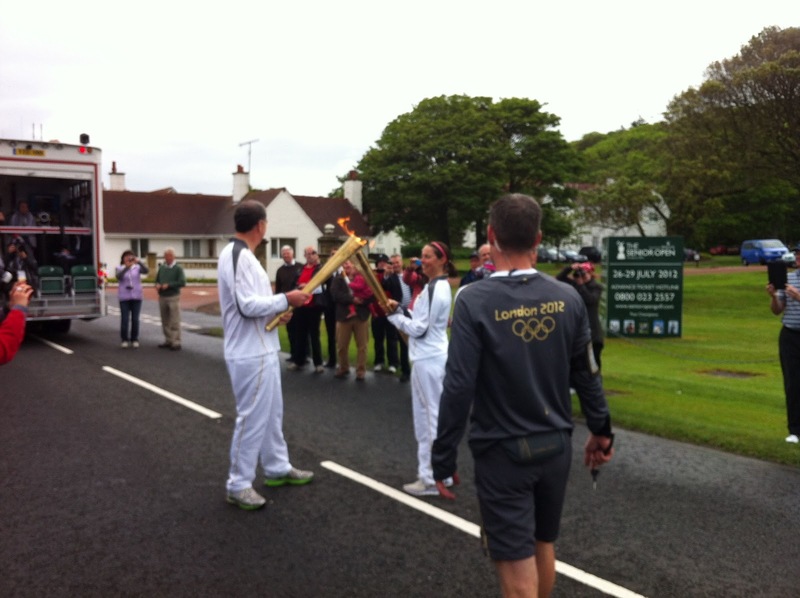 Then, “Stop”, and Toni stood smiling, flame aloft, while the man in the tracksuit brought his unlit torch alongside and an official turned on his butane gas supply with a special Olympic Allen key. 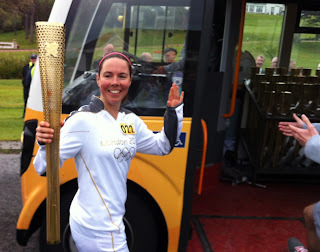 The flame exchanged, he trotted off behind the police outriders and Toni got into a gold painted bus carrying more young people in tracksuits. At the front, in a special compartment, stood around 20 perforated torches, all awaiting their own moment of local photo-glory. Apparently the runners can buy their own torches for the knockdown price of £215, presumably to sell for thousands on e-bay. So much for the magic of the Games. 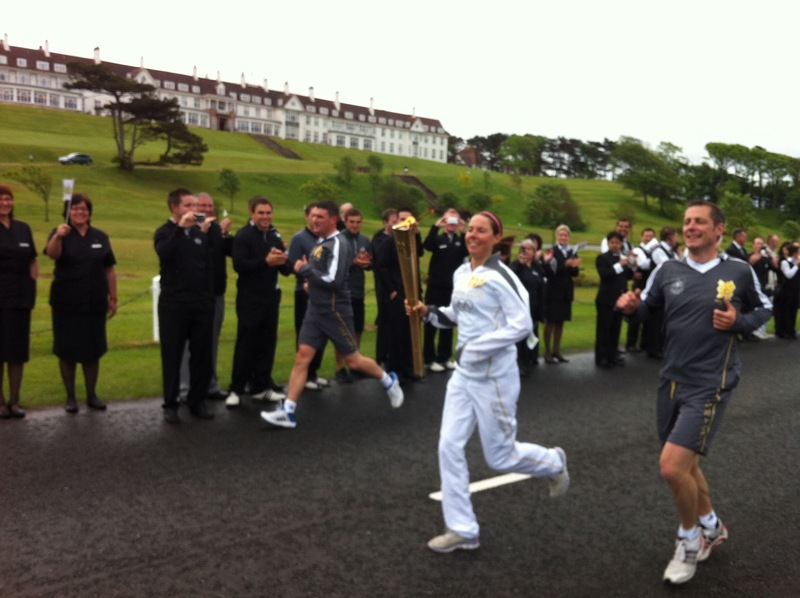 "While the torch will bring the Games to life for many, Scotland is of course already taking part in the Olympics, with world-class football matches at Hampden,” the Government minister had said. I think she meant Egypt versus Belarus: apparently ticket sales have been very slow. 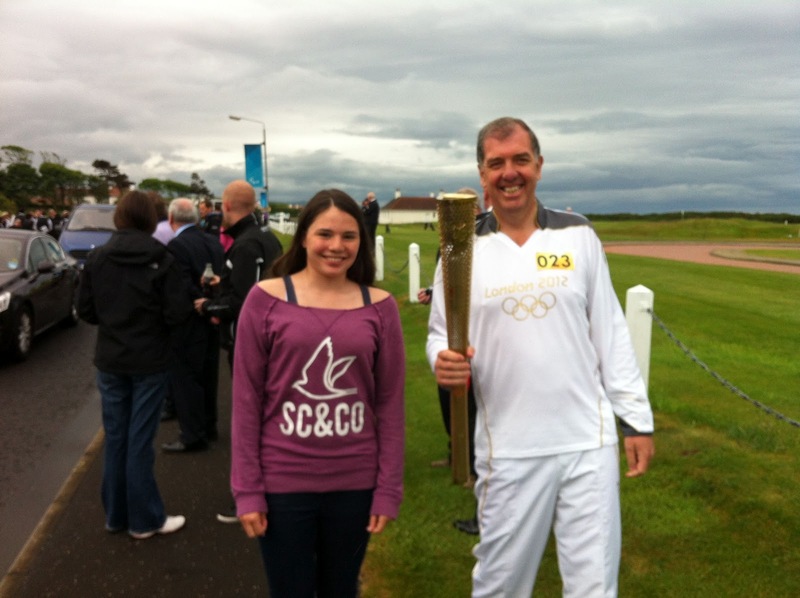 Afterwards I started moaning about how much taxpayers’ money this was all costing. “Nonsense”, said my Mum, “pageantry is really important”. “Ah, but he had too much pageantry”. That’s not really something you could say about this torch relay. Newcastle next stop. [Postscript: This morning, back in Newcastle, I was dropping off some clothes to our local dry cleaners. The lady who does the alterations was in a real state. She was hacking away with scissors at a pair of white tracksuit pants emblazoned with the London 2012 Olympic logo. I recognised them immediately. 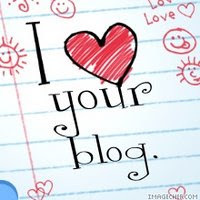 "Why are you destroying that Olympic tracksuit?" I asked. "It's a nightmare," she wailed. "This obese man just walked into the shop and said he was taking part in the Olympic torch relay in Newcastle this afternoon, but they'd given him a tracksuit that was ten sizes too small. So he got a second pair and he's asked me to make a new tracksuit out of the two of them. He wants them in twenty minutes - he's sitting in the cafe opposite in a pair of shorts." "You must be a really good seamstress," I said. She shook her head: "Don't be daft, I've never done this before - I only know how to shorten trousers".